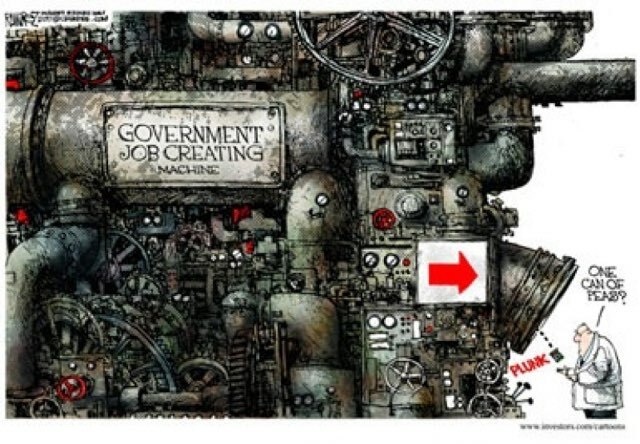 Many politicians have the delusion that government can create jobs (the ultra-delusional among them is Hillary Clinton, who famously said that businesses don’t create jobs but the government does). But outside of its proper functions of the police, the military, and the courts—to protect the individual rights of citizens—the government cannot create productive jobs. On the contrary, its interference in the economy only kills jobs. A case in point: in my home province of Alberta, the government is killing jobs and entire coal towns by decreeing that no electricity will be generated in the province by coal-powered plants after 2030. Why? Because the provincial government in its wisdom has decided that Albertans’ jobs must be sacrificed for its “climate action plan” to deter climate change and coal pollution. As Mark Milke writes in his informative column, all of five coal-fired plants in Alberta will have to be shut down before their natural life spans expire—while 1,600 coal-fired power plants are planned in other countries (700 of them in China). This renders the Albertans’ sacrifice on the climate change altar entirely futile, even if there were evidence for catastrophic man-made climate change caused by burning fossil fuels. As for pollution from coal: thanks to modern technology, it’s negligible and pales in comparison to the benefits to human well-being affordable electricity generated from coal provides. Despite the government’s promises of “transition funds” to help displaced miners and power plant workers, these government efforts will not create new jobs for the mostly blue-collar, rural workers or for those working in industries that depend on mining and electricity generation. These workers will join the roster of over 200,000 currently unemployed in Alberta, about half of them in the depressed oil and gas sector. As Claudia Cattaneo reports in Financial Post, the oil and gas workers are having a difficult time of finding employment still, two years after the collapse of the oil prices. Despite all its talk about diversifying the economy and creating jobs, the government has not managed to do it. And that is because the government—the Alberta government or any other government—cannot diverse the economy, let alone create jobs. Government cannot create jobs because it does not produce anything. Jobs are required to produce and trade goods and services, which is the function of business. Jobs only exist because of firms’ productive activity and when there are customers who are willing to pay more for firms’ products and services than the cost of producing them. In Alberta, besides killing coal, the government over the last two years has done its utmost, although not deliberately, to kill jobs—by hamstringing or chasing away business firms, the true creators of jobs. The government’s anti-business activities deter business in two ways: they increase the cost of doing business, and they increase political risk because of the unpredictability of future anti-business measures. The Alberta government has increased the cost of doing business by, among other things, raising the minimum wage by over 33% (it will be $15/hour in January), increasing income taxes, and adopting the carbon tax. These and other measures have created uncertainty among Alberta businesses and those considering investing here as to what to expect next from the government seeking to expand its control and fatten its treasury. These government actions, added to the depressed oil prices, have contributed to cancelation of major investments (for example, by Shell) or pulling up stakes altogether (such as another oil producer, Apache). Undoubtedly, many other companies have decided to invest in more business-friendly jurisdictions instead of staying in or moving to Alberta. No business investment—no production and trade—no jobs. The only thing government can do to avoid killing jobs and to ensure abundant employment is to get out of the way. This means a complete (gradually implemented) government rollback from the economy and letting the markets operate freely. This means no “climate action plans,” no forcing companies out business, no “employment transition funds,” and no carbon taxes; and no wage controls or any other interference in the economy. Instead, government should limit itself to its only proper function: the protection of citizens’ individual rights (including property rights) against the initiation of physical force or fraud. The result would be free markets where employers and employees would trade with each other without government interference, virtually full employment, and an unprecedented level of overall prosperity and human flourishing.